Exhibition open view Wednesday 19th November 2014, 6pm, NCAD Gallery. Performance by Sarah Pierce, Wednesday 19th November 2014, 7pm, NCAD Gallery. Exhibition continues Thursday 20th November - Tuesday 16th December 2014. NCAD Gallery, 100 Thomas Street, Dublin 8. Gallery opening hours 1pm – 5pm. Admission is free. Image: The Golden Age has yet to come (2012) by Jesse Jones. 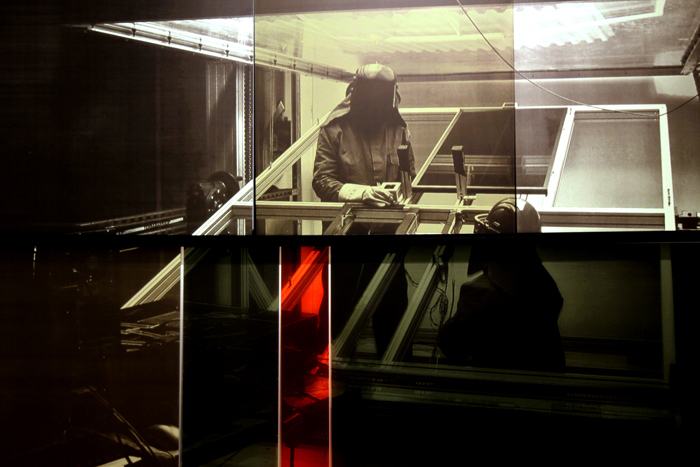 Silkscreen on mirror/glass. Pull Bite Rally is the first exhibition to mark the Black Church Print Studio’s dynamic initiative Process. As part of the Studio’s artistic programme, Process invites leading art practitioners to work with the resources and expertise of the Studio in the production of original artworks. For the Pull Bite Rally exhibition artists Brian Fay, Damien Flood, Jesse Jones, Isabel Nolan and Sarah Pierce present their artworks and continued collaboration at NCAD Gallery. Through explorative processes, the artist's intent is facilitated by the skills and experience of a dedicated printmaking team of master printmakers and print coordinators. This collaboration between artist and the Studio aims to give practitioners a comprehensive understanding of the processes and concepts of printmaking leading to new directions in their practice. Integral and in addition to the exhibition, responses from practitioners, leading figures in the visual arts and the wider public are invited to participate in rigorous inquiry and discussion that Pull Bite Rally invokes. NCAD Gallery’s collegial context affords the opportunity to form close exhibition partner relationships with staff and students from the NCAD College departments and further afield to form a parallel event series. Over the four week exhibition period a programme of events, screenings and talks are scheduled in consideration of the central theme of process. Engaging key topics fundamental to the artists’ project experience, with reference to: the potentiality of collaboration and creative professional links for artists; printed matter and publishing; authorship and reproduction; medium specificity; professional practice pathways, skills and exchange; pedagogical foundations and shifts in contemporary art practice. To mention only a few of the event highlights, kindly funded by The Research Institute at NCAD, Declan Long is in conversation with artist and 2014 Turner Prize nominee, Ciara Phillips, on Monday 24th November, 6pm. In a special one-off episode of TV Museum: The Mini-Series, Maeve Connolly investigates temporal, social and political aspects of serial publication and distribution. Connolly’s titled ‘Serial Publications and Practices’ lecture reconsiders some of the strategies employed by General Idea and also explores the work of various contemporary artists and institutions engaged in the production of newspapers, journals and serialised moving images, posing questions about the changing form and function of seriality in art, media and culture - Wednesday 3rd December, 5pm. ‘Repeat. Don’t stop’ is the NCAD MA Art in the Contemporary World organised public seminar that delves into ways to critically engage with current forms of artistic repetition and reproduction, considering how ideas and processes explored in the Pull Bite Rally exhibition relate to the broader contexts of twenty-first century art, Friday 28th November, 2pm. Please see the full event listings below. * On the occasion of the exhibition writer Niamh Dunphy is commissioned to write the essay ‘Trace and Use’ published in the Pull Bite Rally pamphlet available throughout the exhibition at NCAD Gallery. Exhibition team: Anne Kelly (Curator) / Hazel Burke / Colin Martin / Mary A.Fitzgerald / Michelle Browne. Wednesday 19th November 2014, 7pm. NCAD Gallery. Exhibiting artist, Sarah Pierce performance on the opening night of Pull Bite Rally. Friday 21st November 2014, 5.30pm. Harry Clarke House Lecture Theatre, NCAD. Screening of ‘Before the page is turned’ by Jaki Irvine. Monday 24th November 2014, 6pm. Harry Clarke House, NCAD. Ciara Phillips, artist and 2014 Turner Prize nominee in conversation with Declan Long. NCAD Research Institute funded keynote lecture. Friday 28th November 2014, 2pm - 4pm. Harry Clarke House, NCAD. Repeat. Don’t stop. In this MA Art in the Contemporary World public seminar, ways to critically engage with current forms of artistic repetition and reproduction, considering how ideas and processes explored in the Pull Bite Rally exhibition relate to the broader contexts of twenty-first century art are considered. Friday 28th November 2014, 5.30pm. NCAD Gallery. Process Artists Talk, exhibiting artists event with the initial three Process project artists Brian Fay / Damien Flood / Jesse Jones with master printmakers Debora Ando / Mary A. Fitzgerald / print coordinator Dave McGinn, chaired by artist Colin Martin. Monday 1st December 2014, 2pm. NCAD Gallery. Sarah Pierce in conversation with Donal Maguire, curator and Administrator of the ESB Centre for the Study of Irish Art at the National Gallery of Ireland will talk about the collaboration between the artist and the archive in the context of Pierce's work, My dear Betty. Wednesday 3rd December 2014, 5pm. Harry Clarke House, NCAD. Serial Publications and Practices In a special one-off episode of TV Museum: The Mini-Series, Maeve Connolly investigates temporal, social and political aspects of serial publication and distribution. The lecture reconsiders some of the strategies employed by General Idea and also explores the work of various contemporary artists and institutions engaged in the production of newspapers, journals and serialised moving images, posing questions about the changing form and function of seriality in art, media and culture. Friday 5th December 2014, 5pm. Harry Clarke House, NCAD. The current NCAD 4th yr BA print department artist collective, GUM Collective screen their self-made documentary on what it means to be part of a collective with Q & A. GUM will also launch their current publication. Wednesday 10th December 4.30pm. Black Church Print Studio ‘Prosperity Project’, Jesse Jones in conversation with Jaki Moore of the OPW and artist Raymond Henshaw to discuss the percent for art commission for the Convention Centre Dublin. Friday 12th December, 5pm. Harry Clarke House, NCAD. ‘The Palimpsest Project’, NCAD Fine Art Print Department presents a lecture and student discussion forum. A thirty minute screening of the student time lapse animation spanning over ten years introduced by the Head of Fine Art Print, Andrew Folan. The Black Church Print Studio is supported by the Arts Council of Ireland annual Project Funding Award.